Demetrin Prazepam is a benzodiazepine medication, a tranquiliser used for the treatment of moderate to severe anxiety and panic disorders. 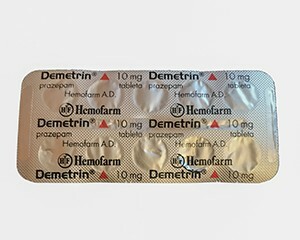 Prazepam is the active ingredient of Demetrin. Prazepam has an effect on gamma-aminobutyric acid (GABA). GABA is the brain's quieting or tranquilising neurotransmitter, possessing an inhibitive effect on the transmission of nerve signals. Prazepam and other benzodiazepines enhance the effect of GABA, thus slowing down the transmission of nerve signals. Demetrin Prazepam comes as a tablet and capsule to take by mouth. It usually is taken several times a day and may be taken with or without food. Short-term therapy is advised, treatment should generally be no longer than 4-6 weeks, including a tapering off process. Tolerance has been noted with long term use. Do not take prazepam for longer periods unless strictly instructed by your doctor. Demetrin Prazepam should not be stopped abruptly. Sudden discontinuation may lead to withdrawal symptoms. The dosage of prazepam should be gradually reduced according to the advice of your doctor. Never exceed the prescribed dose of prazepam. - You have suffer from mental illness or depression. If you take several doses per day and miss a dose, skip the missed dose and continue your regular dosing schedule. Do not take a double dose to make up for a missed one. Store this medication at room temperature and away from excess heat and moisture (not in the bathroom).